From Kern, Thomas, and Hughes. See link above. I am currently taking a Foundations of Curriculum and Instruction course at UIC. Our textbook, while a medical curriculum textbook, reminds us that curriculum design crosses education fields and that what we are doing in our classes every year has its grounding in research. Kern, Thomas, and Hughes in their book provide a 6-step approach to curriculum development. My goal is to share the theory behind our current practices to serve as a guide as design and redesign our courses. Steps 1 and 2 can be found here. 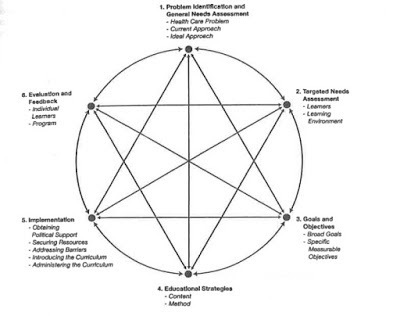 Once we have identified the needs of our learners, we need to clarify our goals and objectives. While there may be some differences in how these terms are used in our various institutions, on the broader level, goals are the overall purposeful outcomes while objectives are measurable elements. When we state our goals, they help us to define and clarify our content, priorities, learning methods, and evaluation/assessment outcomes. These are not only important for ourselves as we re/design our courses, but they are also important to communicate clearly to all stakeholders--peers, parents, students, administrators, etc. According to Kern et al. there are five elements to keep in mind when writing a clear and measure objective: who will do how much (or how well) of what by when? A key here is to use descriptors that are less open to interpretation. For example, how can we measure the verb "know" as opposed to "identify, list, recite, define, etc." For this step I wonder a few things, but many depend on the situations at our individual institutions. For example, do we know the overall purpose of our course? If there is not a clear "out" such as an AP exam or placement test, why do we cover the content and skills that we do? Do we consider the general and targeted needs assessments as described in the previous blog posts? Furthermore, does our course align to and build upon the goals of the courses before/after it in the sequence? Does it need to? If we are unable to articulate these goals and objectives, then we often end up duplicating assessments if not content and essential questions. Additionally, we may end up over-emphasizing a specific assessment-type when it doesn't really measure the outcome we are looking for. For example, is the focus of my English class to read a novel or is the focus to practice skills via the novel? If we are not clear in the focus of materials versus objectives, we may over-assess in some areas (for example plot of a text) when our main goal is something more sophisticated. We also may misrepresent the total number and weight of questions that are not the focus of our stated objectives. If we want students to practice more higher-level skills, more of our assessments should be weighted this way. This further leads to a question of assessing Socio-Emotional skills and other subjective measures. If we assess objectives like "paying attention," are those elements we instruct and model? Are they truly the objectives we want to assess in our course? If they are, we should be clear about how they are instructed and assessed. If they are not, we should realign our focus to the objectives we do want to measure. Once these goals and objectives are established, we are then able to move on to Step 4: Instructional Strategies, which I will discuss in the next blog post.